Its own art-forms and cultural expressions and ramifications distinctly showcase Manipur to the World. 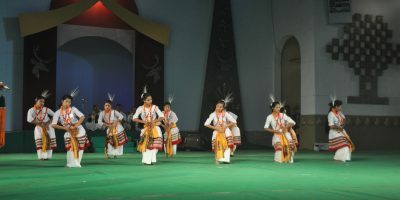 Its famous classical dance remains unique in all Manipuri dance forms whether it’s folk, classical or modern and has a different style and gesture of movement. Love of art and beauty is inherent in the people and it is difficult to find a Manipuri girl who cannot sing or dance. Manipuris are artistic and creative by nature. This has found expression in their handloom and handicraft products, which are world-famous for their designs, ingenuity, colorfulness and usefulness. Each ethnic group has its own distinct culture and tradition deeply embedded in its dances, music, customary practices and pastimes. Raas Leela:- The Raas leela, the epitome of Manipuri classical dance is inter-woven through the celestial and eternal love of Radha and Krishna as has been described in the Hindu scriptures and reveals the sublime and transcendental love of Krishna and Radha and the Gopi’s devotion to the Lord. It is generally performed in an enclosure in front of the temple throughout the night and watched with a deep sense of devotion. 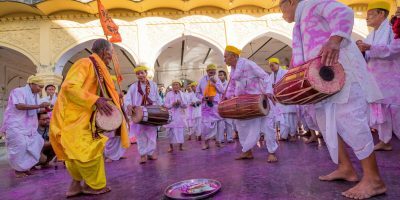 Raas performances are seasonal and varied and performed at the temple of Shree Shree Govindajee in Imphal in the nights of Basanta Purnima, Sarada Purnima and Kartik Purnima and at local temples later. As to the composition, the performance is a combination of solo, duet and group dances. This highly stylised form of dance has sublimity, subtlety and grace. The richness of the costumes gives lustre to the beauty of the art. Nupa Pala:- Nupa Pala which is otherwise known as Kartal Cholom or Cymbal Dance is a characteristic of the Manipuri style of dance and music. The initial movements of this dance are soft and serene , gradually gathering momentum. 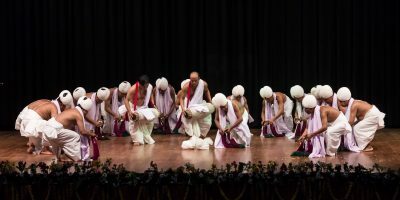 It is a group performance of male partners, using cymbals and wearing snow white ball-shaped large turbans, who sing and dance to the accompaniment of Mridanga, an ancient classical drum “Pung” as it is called in Manipuri. The Nupa Pala acts as a prologue to the Ras Lila dances, besides an independent performance too, in connection with religious rites. Pung Cholom:- Pung or Manipuri Mridanga is the soul of Manipuri Sankritana music and Classical Manipuri Dance. It assumes an important ritual character, an indispensable part of all social and devotional ceremonies in Manipur,-the instrument itself becoming an object of veneration. Pung Cholom is performed as an invocatory number preceding the Sankirtana and Ras Lila. It is highly refined classical dance number characterised by the modulation of sound from soft whisper to a thunderous climax. There is the interplay of intricate rhythms and cross rhythms with varying markings of time from the slow to the quick with graceful and vigorous body movements leading to ecastic heights. Maibi Dance:- During the festival of Lai-Haraoba which is an annual ritual festival of the Meiteis, the inhabitants of the valley of Manipur, the Maibis, the priestesses considered to be spritural mediums, trace through their dances the whole concept of cosmogony of the Meitei people and describe their way of life. Beginning with the process of creation, they show the construction of houses and various occupations of the people to sustain themselves. It is a kind of re-living of the way of life of the past. 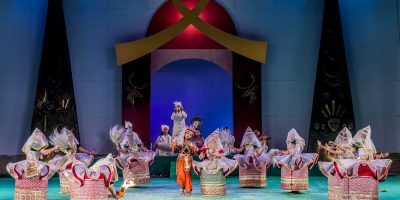 Khamba Thoibi Dance:- Khamba Thoibi dance is a duet of male and female partners, a dance of dedication to the sylvan deity, Thangjing of Moirang , is the depiction of the dance performed by Khamba and Thoibi, the hero and heroine of the Moirang episode of the hoary past. This, with the “Maibi” dance (Priestess dance) , the “Leima Jagoi” etc. form the “Laiharaoba” dance. 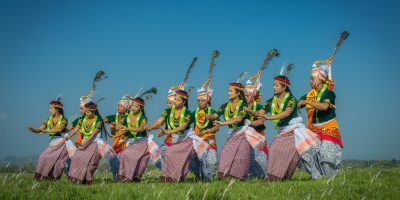 The “Laiharaoba” dance , in many ways, is the fountainhead of the modern Manipuri dance form.This dance is a part and parcel of Moirang Lai-Haraoba. It is belived that the legendary hero – Khamba and heroin – Thoibi danced together before the Lord Thangjing, a celebrated deity of Moirang, a village in the South-West of Manipur which is known for its rich cultural traditions, for peace and prosperity of the land.